The word "Caledonian" is used by the French and others who have settled in the islands. The term "Kanak" is used to designate native residents of this South Pacific archipelago and their culture. Identification. The Kanak culture developed in this South Pacific archipelago over a period of three thousand years. Today, France governs New Caledonia but has not developed a national culture. The Kanak claim for independence is upheld by a culture thought of as national by the indigenous population. Location and Geography. Kanaks have settled over all the islands officially indicated by France as New Caledonia and Dependencies. The archipelago includes the principal island, Grande Terre, Belep Island to the north, and Pines Island to the south. It is bordered on the east by the Loyalty Islands, consisting of three coral atolls (Mare, Lifou, and Ouvea). Grande Terre, which is 250 miles (400 kilometers) long and at the widest point extends for 30 miles (50 kilometers), is divided by mountains averaging 2,600 feet (800 meters) in height. A coral reef approximately a mile from the coast surrounds the island with a shallow lagoon. Descending from the mountain chain, numerous rivers have created wide, green valleys with steep slopes. On the drier west coast great plains are separated by several large rivers. With rich soil limited to waterway banks, the Kanaks developed a system of slash-and-burn agriculture, which over centuries reduced the primary forest surface, shrunk marshes, and favored the extension of herbaceous savannah. Dense forest covering the Loyalty Islands has provided natural compost for agriculture. The Kanaks occupy the Loyalty Islands entirely. 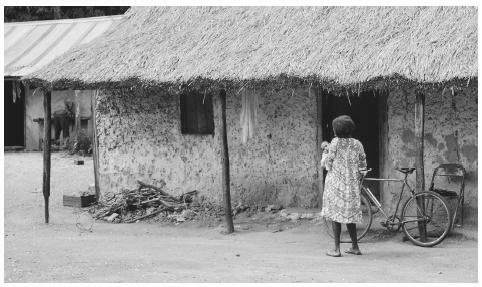 Those on Grande Terre live on the northern half of the island in territories demarcated in the nineteenth century as "indigent reserves." Farther south, Kanaks are less numerous, although 30 percent of them live near the capital, Noumea. Demography. In 1996, there were 196,836 inhabitants, up from 164,173 in 1989. Kanaks number 86,788, or 44 percent of the population; Europeans, 34 percent; Polynesians (Wallisians and Tahitians), 12 percent; and Asians (principally Indonesians and Vietnamese), 4 percent. The population is young; 47 percent of Kanaks are less than twenty years old, but that number falls to 31 percent among Europeans. Linguistic Affiliation. French, the official language, is spoken by most residents; Indonesian, Vietnamese, Tahitian, Wallisian, and Chinese are among the twenty-eight languages spoken by Kanaks. Apart from the population of French origin, all the inhabitants are at least bilingual. Command of the French language varies with the academic and social status of individuals. Languages spoken by Kanaks, which are classified as Austronesian, belong to the linguistic family spoken by the Oceanians who progressively peopled the Pacific islands over ten centuries. Contact with the Anglo-Saxon navigators and traders who reached the archipelago in the nineteenth century led to the formation of a pidgin English, Bichelamar, that disappeared when French was established. For two decades Kanaks requested that their languages be recognized and taught. Four of those languages now can be studied to earn a Bachelor's degree, and in 1988 the French state authorized the study of regional languages in elementary schools. French, whose use has been protested by Kanak nationalists, is used in politics; vernacular languages are reserved for private life. Symbolism. The flag Kanaky, a yellow solar disk with a hut ridgepole set against three bands of color—green (vegetation), red (the people's blood), and blue (sea and sky)—signifies the desire for independence. The flag is tolerated by the administration, which recognizes the French flag. Since November 1998, Caledonians have been asked to seek symbols of a "new citizenship" with which all the communities can identify. The shared national reference is the land: ancestral land for Kanaks, a land of exile for settlers, or a land of welcome for recent immigrants. Emergence of the Nation. For the population of French origin, "New Caledonia is France." Slowly, through the experience of colonialism, the native population formed the idea of a separate nation. Before colonization by the French in 1853, linguistic and territorial divisions separated Melanesian groups. Social and racial discrimination practiced by whites commingled all Pacific blacks and then only those of New Caledonia under the term "Kanak" ( kanaka means "human being" in Hawaiian). In the 1970s, local nationalist movements took up this term as a symbol of the colonized people's unity. National Identity. Common markers of national identity among the Kanak include the cultivation of yams and taros, a hierarchy that differentiates high-ranking persons (masters of the soil and chiefs) from lower status persons, kinship relations, the practice of nonmercantile ceremonial exchanges between clans and chieftainships for marriages and funerals, and belief in ancestors' presence among the living. Ethnic Relations. The introduction into the islands of colonized nation–states, borders drawn between archipelagos, and objections to "indigent" travel through boat destruction broke ancient bonds. However, over thirty years, independence in a number of Pacific countries has encouraged Oceanians to resume contact. The indigent peoples of Oceania have developed an ideology of a "Pacific way" that acknowledges a common culture that overcomes geographic and political divisions. Kanaks and other ethnic groups form withdrawn communities that maintain functional connections (economic, educational, and administrative). The social universe is split in two: on one side are Kanaks with their "customs" and nationalistic claims; on the other side are communities that wish to keep New Caledonia as part of the French republic. This division led to violent conflict during the period of 1984–1988. Noumea, the capital created by early French colonists, is the only large city. Greater Noumea, including Paita and Mont Dore, holds 90 percent of non-Kanak population and 34 percent of Kanaks. Kanak cultural foundations are rural, and even in cities demands for "custom" are essential, although Kanaks born in Noumea are slowly building an urban culture. Over the last twenty years, wooden colonial houses with verandas and gardens in Noumea have disappeared, replaced by styleless buildings. Kanaks have maintained a form of architecture (a round hut of wood and straw pitched against a central pole) found in the Loyalty Islands; the nationalist movement has revived traditional construction on Grande Terre. The most noteworthy local administration building is the Tjibaou Cultural Center in Noumea. The architect, although influenced by traditional Kanak houses, used modern construction techniques. For Kanaks space is divided between premises reserved for important men and other residences placed closer to the women and children. This arrangement is still used during gatherings, but no official spatial discrimination exists between communities. Kanaks avoid being alone in empty spaces. Food in Daily Life. Kanaks traditionally eat yams, taros, bananas, and sweet potatoes, which until recently accounted for the bulk of their diet. A decline in horticulture, access to wage-earning jobs, the installation of electricity in villages, and travel to Noumea have altered eating habits. Rice has tended to replace yams and taro, and frozen food, beef, and mutton substitute for wild pork, deer, fish, and bats. Food Customs at Ceremonial Occasions. Sea cow, turtle, and fish remain ceremonial dishes, along with bougna, a dish of steamed yams and meat cooked under hot stones. Introduced by Europeans, beer and whiskey are the inevitable drinks at festivities and on weekends. Basic Economy. The economy is founded on nickel mining and import trade. Financial transfers that account for up to 50 percent of the budget are received from France; local production (agriculture, animal breeding, and fishing) accounts for 3 percent of the gross domestic product. A small coffee industry and subsistence farming counterbalance the poverty of the land reserves. The average income of Kanaks is seven times lower than that of Europeans. Land Tenure and Property. Clan and lineage systems are patrilineal and form the basis of Kanak social units for private land ownership. Families that belong to these inclusive entities attain land. If a family has no descendant, property goes back to the lineage and clan and is redistributed to one of its members. French law recognizes only collective property on Kanak land reserves. To attain individual private property, Kanaks must buy land or real estate outside the reserves. Commercial Activities. Most food products come from Australia, New Zealand, and France. Public services (health, schooling, justice, and administration) are managed by the French. Major Industries. Nickel, the principal raw material, is sent semirefined to France. No manufactured object is made entirely in the archipelago. 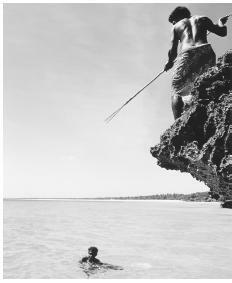 Man fishing from a rock ledge; fish is a national ceremonial food. activity is conducted exclusively by Europeans and Asians. Training and management are mainly in the hands of Europeans. Classes and Castes. 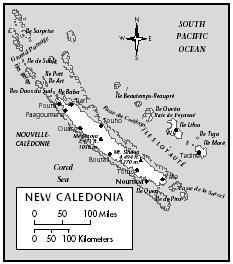 Through the nickel industry, New Caledonia formed a working class that included people from all ethnic groups. European farmers settled on colonized lands in Noumea, forming a white bourgeoisie with a high standard of living. At the bottom of the social scale, Indonesians (farm workers) and Kanaks on reserves struggled with poverty. Today, the working class has increased as the nickel industry and trade have developed. The arrival of professionally qualified French people has enlarged the middle and upper classes. Kanaks have difficulty finding work. Government. The government consists of an authority representing the French state, an elected territorial assembly, and an executive council composed of eleven ministers. Leadership and Political Officials. Members of the government are expected to adopt a collegial form of administration in the interests of all Caledonians, while political confrontations are limited to the territorial assembly. Elected members of the independence parties (minority) and anti-independence parties (majority) sit in these two political structures. Apart from these official mechanisms, Kanaks participate in other forms of political life. In this "customary" system, which is organized around chiefdoms recognized in the nineteenth century by the French administration, chiefs are named by notables and the state. Kanak independents in electoral proceedings (municipalities, provinces, and the territorial assembly, etc.) take into account the importance and influence of chiefs, who have been given an advisory capacity role in a "customary senate." Social Problems and Control. The French judicial system applies to New Caledonia, but for matrimonial and landowning issues, Kanaks refer to traditional practices in accordance with the "specific rights" statute recognized by the Constitution. For criminal affairs concerning Melanesians, courts are aided by "customary assessors," Kanak men and women who explain their countrymen's behavior. Although theft is rare, murder is three times more common than it is in metropolitan France. Penal sanctions are often misunderstood in an ancient warrior society that does not always side with victims. Numerous matters are settled outside the French justice system by "customary courts" or direct vengeance. Military Activity. The French army ensures the regional security of New Caledonia. Kanak nationalists do not have an army. Caledonian workers contribute to a social security fund. A Free Medical Aid organization helps the poor. Several Australian, New Zealander, and international organizations intervene marginally in the sanitary, environmental protection, and "aid to women" fields. Division of Labor. In the Kanak culture, each member of a couple fulfills specific and complementary tasks for work in the fields. Women prepare meals, care for children, and carry wood. The Relative Status of Women and Men. Men have a monopoly in public speaking, landowning rights, and religious rituals. Only aged or high-ranking women play a role in those areas. Marriage. It is common practice to take a spouse from outside the clan but inside the close parentela. The kinship system authorizes marriage between cousins of different clans (cross-cousins). Most of these monogamous matrimonial alliances are arranged by families to unite persons of similar rank and maintain an equilibrium between the women given and received by each clan. The husband's clan gives that of the wife matrimonial compensation in the form of food-producing goods, clothing, shell currency, and more. The number of marriages has diminished as the level of compensation has continued to increase. Kanak society tolerates divorce, but the wife returns home without the children, who remain in the husband's care. No official remarriage exists. Domestic Unit. Familial residences are situated on the husband's clan site; often several generations live together. The master of the grounds, who is the father or grandfather of the children, generally has about ten persons under his authority. Men and women tend to group separately for meals and sometimes for sleep. Women handle the domestic tasks. Inheritance. Land rights are transmitted from father to son, with daughters being excluded from inheritance. Otherwise, objects acquired in a lifetime are turned over to maternal uncles (the mother's brothers). Kin Groups. A family fits into a lineage that is a segment of a wider patrilineal clan. Each region has a variable number of exogamic clans whose members are dispersed within territorial units made of several clans. They assemble for marriages and funerals or to assert landowning rights together. Infant Care. Small children are carried by the mother or father and do not sleep in separate places. Very early they are informed of their rights and duties in the family and the political hierarchy. To pacify them, parents give in to their whims as long as children do not disobey kinship taboos. Most New Caledonian women prepare meals, care for children, and carry wood. Child Rearing and Education. Boys are given more freedom than are girls. Valued traits include the ability to defend oneself and face challenges, as well as the traditional indispensable know-how (knowledge of clan history, medicinal plants, and political relationships between groups). Children are considered to have the temperament of a grandparent. Children are all educated in either public or religious schools; however, the failure rate is high. Higher Education. To attain skilled jobs, Kanak families now encourage children to receive a higher education. The proportion of Kanak students obtaining a bachelor's degree has increased. Kanaks show respect in personal interactions. Certain relationships involve compulsory familiarity. One respects maternal relatives, one's elders, and aged persons, but maintains a joking relationship with paternal aunts and cross-cousins. Women must respect men by maintaining spatial distance, keeping silent, and using special terms of politeness. Familiarity allows people to stand close together, touch, and talk together. In public places, Kanaks adopt a discreet and subdued attitude, avoiding excessive speaking or gesticulating, which are considered rude. Contact with strangers is marked by gifts and formal speech. Strangers are observed attentively from afar and judged on the basis of their behavior. Religious Beliefs. Kanaks are all officially Catholic or Protestant but maintain a belief in an immanent ancestral presence under diverse forms or totems (animals, plants, minerals, and atmospheric phenomena). Religious Practitioners. There is no priestly caste, but each lineage has a guardian of the magic that protects the clan. Rituals and Holy Places. Rites that invoke ancestors are domestic. There are no collective religious rituals. Sacred places, old dwelling sites, and cemeteries exist, but propitiatory rites are made individually. Death and the Afterlife. Kanaks believe the land of the dead is underwater. It receives the souls of those who have had funeral ceremonies that continue for one year after death; through those ceremonies, one becomes an ancestor. A dancer performs a traditional dance in Moumea. Kanaks maintain a belief in an immanent ancestral presence under diverse forms or totems. Death and sickness seldom are considered natural; they are often attributed to witchcraft or vengeance from ancestors for insufficient respect. Sickness is healed by plants and invocations. Everyone has a well-developed knowledge of these remedies, but people sometimes employ a specialist. Healers provide treatment and identify persons considered guilty of witchcraft. Dispensaries and hospitals are used by Kanaks, who simultaneously resort to traditional cures. French Independence Day on 14 July is celebrated principally by the European community. Since 1984, Melanesian nationalists have tried to make 24 September, the day of the takeover by the French, a public holiday called Kanak Mourning Day. Support for the Arts. Kanak and Caledonian artists are aided by the Kanak Culture Development Agency, which manages the Tjibaou Cultural Center. They also are members of independent associations that receive grants from the New Caledonia Territory and the French state. Literature. Oral literature consists of poetry, epics, tales, myths, and historical accounts. There have been several publications, but the majority of texts collected in vernacular languages are unpublished. A written modern Kanak literature has emerged. Graphic Arts. Sculptors, painters, and illustrators are inspired by ancient and modern art. They show their work at the Tjibaou Center, in galleries in the Pacific countries, and at international art festivals. Performance Arts. Kanak music is marked by the kaneka, inspired by traditional rhythms, reggae, and rock. Dramatic art has begun to appear. Physical and social sciences are taught at the University of Noumea, created in 1986, which has courses only for the first and last years; therefore, students also must study in France. Research is done at public institutions such as the CNRS, the IRD, and the CIRAD. Bensa, A. Chroniques kanak. L'ethnologie en Marche, 1995. ——. Nouvelle-Calédonie: Vers l'émancipation, 1998. ——, with Antoine Goromido. "The Political Order and Corporal Coercion in Kanak Societies of the Past (New Caledonia)," Oceania 68 (2): 84–106, 1997. —— and J. C. Rivierre. Les Chemins de l'alliance: L'Organisation Sociale et ses Représentations en Nouvelle-Calédonie (région de Touho, Aire Linguistique Cèmuhî), 1982. Bensa, A., and I. Leblic, eds. En Pays Kanak: Nouvelle-Calédonie, Ethnologie, Linguistique, Archéologie, Histoire, 2000. Boulay, R., ed. De Jade et de Nacre: Patrimoine artistique Kanak, 1990. Clifford, J. Person and Myth: Maurice Leenhardt in the Melanesian World, 1982. Connell, J. New Caledonia or Kanaky? The Political History of a French Colony, 1987. Dauphiné, J. Les Spoliations Foncières en Nouvelle-Calédonie (1853–1913), 1989. David, G., D. Guillaud, and P. Pillon. La Nouvelle-Calédonie à la Croisée des Cemins, 1999. Douglas, B. Across the Great Divide: Journeys in History and Anthropology: Selected Essays, 1979–1994, 1998. 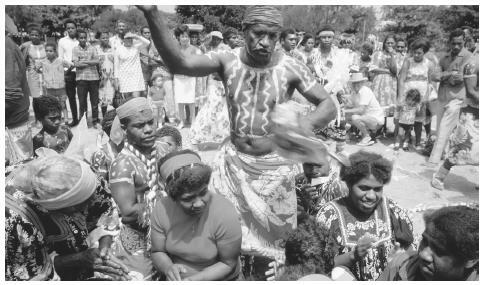 Dussy, D. "Les Suats de Nouméa: Des Occupations Océaniennes Spontanées à la Conquête Symbolique de la Ville en Nouvelle-Calédonie," Journal de la Société des Océanistes 103: 275–287, 1996. Freyss, J. Économie Assistée et Changement Social en Nouvelle-Calédonie, 1993. Leblic, I. Les Kanak Face au Développement: La Voie Étroite, 1993. Leenhardt, M. Notes d'Ethnologie Néo-Calédonienne, 1930. Maclellan, N., and J. Chesneaux. After Moruroa: France in the South Pacific, 1998. Merle, I. Expériences Coloniales: Nouvelle-Calédonie, 1853–1920, 1995. Naepels, M. Histoires de Terres Kanakes: Conflits Fonciers et Rapports Sociaux dans la Région de Houaïlou (Nouvelle-Calé) , 1998. Ozanne-Rivierre, F. "Structural Changes in the Languages of Northern New Caledonia." Oceanic Linguistics 34 (1): 44–72, 1995. Rivierre, J.C."La Colonisation et les Langues en Nouvelle-Calédonie." Les Temps Modernes 464: 1688– 1717, 1985. Saussol, A. L'Heritage. Essai sur le Problème Foncier Mélanésien en Nouvelle-Calédonie, 1979. Shineberg, D. They Came for Sandalwood, 1967. Tjibaou, J. M. La Présence Kanak, 1996. Wittersheim, E. with A. Bensa. "Nationalism and Interdependence: The Political Thought of Jean-Marie Tjibaou," Contemporary Pacific 9 (2):181–210, 1998.
this is very helpful 4 mi project thanks so much! Social Isssues on New Caledonia. This is really helpful for class projects and research papaers on the island of new caledonia. i love this, it is helping me and my group for our presentation. Very educational, Foriegners who are planning to work in New Caledonia has more than to gain knowing about the people, cultures and among others. Thank you very much. This was very helpful but it doesn't say about any clothes. i was just wondering have new caledonia had any natural disaters happen at any year? I had almost given up on any hope of finding information on Kanak culture..
this is going to help me in my exams so much!! I am trying to find a WWII Marine Airfield, that was located near a leper colony, that had cliffs and caves large enough to house 2 TBF Avenger Torpedo Bombers, during the day. This arifield was also bombed by the Japanese daily during that time, I believe it was used from 1942 through 1944/45. Any information, about units, Marines, etc. would be greatly appreciated. I am researching this information based on sketchy accounts by a former Marine, 1st Marine Division, Airwing. He is 88 years old and remembers virtually nothing. Any help?? This information was helpful for my project on New Caledonia thanks. This was very helpful for my social studies project! How did the name SAINT-YVES originate in New Caledonia? This was a very good site because im doing an project over this! I have found this site extremely helpful is discovering about the New Caledonian culture. My great grandfather was from Noumea and moved to Sydney in the 1940s. Does anyone know of resources or contact i could use to trace back my family history? this was helpful. lots of information for my question. thank you very much. I wish to learn how "SAINT-YVES" appeared in New Caledonia, please. The New Caledonia Great Barrier Reef is the second largest great barrier reef in the world. The world's highest biodiversity of seal snails is found in the waters off New Caledonia. There are two families of sponges, that are considered living fossils, and the waters off New Caledonia is one of the last refuges of the endangered dugong. The waters off New Caledonia also has an endemic species of nautilus. But on the land there are 3,380 species of endemic plants, including the world's only parasitic conifer. There are also 22 species of endemic birds on New Caledonia, including the kagu, which is also New Caledonia's only endemic family of birds. New Caledonia is a living laboratory of biodiversity, that rivals the Galapagos Islands and the Hawaiian Islands. This was VERY helpful for my last minute homework!! GOOD CULTURE &FAMILY MEDICAL AID FOR POOR IS APPRECIATED. my mother was born here. she returned home with my dad who was in the army. she never really adapeted to the life of the united states. she returned home once. the pilot surprisely was a classmate of hers in noumea. this was a real surprise. I am trying to locate descendants of the Boucasse family , living in Noumea in the early 1940's. Any help would be appreciated. All I have is a name Matilda Boucasse. born roughly 1930. Im looking to find relatives of Alfred LaBorde (spelling?) 1940s 1949 may have been living Turtle Bay not sure if there is still such a place or any imformation, May have had a son living in Australia.Or how could I go about finding this person or place. Hey dude, I've got a project due on Monday, and this was UBER helpful. I nearly gave up on my search before I found your website! Seriously, thanks so much. OMG THIS WEBSITE IS SO HELPFUL FOR MY NEW CALEDONIA SOCIAL STUDIES PROJECT EVEN THOUGH IT DOESENT SHOW PROBLEMS OF RACIAL EQUALITY THIS IS a fake information im melanesian and i live in new caledonia and this is all false my great great great grandfather has passed down stories to this generation the stories my grandpa tells today is real this is fake please shut this down.